This summer has just flown by! I am not complaining because as soon as the end of summer hits then all the Halloween stuff comes out, and that makes me very excited. Another exciting moment, I sold all 5 of my Lady Bud Vases! This is the first clay work that I have sold. I might have to make more of these soon. Here is the design for the Fire Dragon. The neat thing that I haven't pointed out is they open up so you can put little trinkets in them. I finally finished another page for my Mini-Drawing/Paintings. Over the summer Chris Cornell from Soundgarden passed away. I shared this charcoal and graphite drawing I did of him when I was about 16 or 17 years old. We tried Pho for the first time and loved it! We planted a tree with my Mom's ashes on her birthday. This tree is in my sister's backyard. My sister picked out a Crab Apple Tree. I can't wait to see the blossoms from it! All 3 of us kids helped push the dirt back in to cover the ashes. The very next day my niece got married. We had such a great time at this wedding. A really great thing that happened, there was another wedding party outside by the pool of the country club. As it got dark out it started to rain, this poor couple lost most of their cake and a lot of their decorations to the rain. My sister went down and invited them up to share the ballroom with us. We had such a blast! At the end of July, my sister and 2 of our cousins, took a girl trip to St. Augustine. We ended up at the Fountain of Youth and there were a bunch of peacocks hanging around. This guy was just sitting there posing for me. I finished these a couple of months ago. I was waiting to take the photos of all of them completed, If you follow along with my monthly adventures you will remember I was building on these during the fall. I do love how they came out. I used the same technique to start them by making pinch pots and putting them together to create the ball. I then created the features I wanted for each of the faces. Each one is about the size of a smaller grapefruit. First up is my Big Mouthed Monster. He is super cute and I modeled him a little after Mike from Monsters, Inc. This is the Big Mouthed Witch. I wanted to make her a little hat but the clay got to dry and I decided I liked her the way she was without one. After she was completed I realized she reminded me a bit of Mad Madam Mim from The Sword in the Stone. This one is Big Mouthed Jack. I wanted to do a fun Jack O'Lantern. I really like the way this came out. After finishing him I kind of wished I would have done a darker color for the inside because there isn't enough contrast from the outside. This little pumpkin started out with the idea to create another Jack O'Lantern. I decided to put the little leaf on the top and decided to not give it a face. The glazing on this came out darker than expected but I find it very pretty. If you would like to follow along with process or just some creative randomness you can follow me on Instagram and Facebook. I have been having a hard time keeping up with this blog lately. I have been keeping myself so busy with not only my business but also with a few personal projects I started. This month I took another session of the wheel-throwing class. Here are some of the pieces I have thrown this month. I wanted to try bellying out this bowl and if you really look closely you will notice that it is not even on both sides. I did figure out what I did wrong here. I didn't take pictures of the clay cut out and when it was fired on these stars. I used these as test tiles, to test out some of the glazed I purchased. Some of them are so pretty. This is the bowl from above after it was trimmed. This is another thrown piece and I like the shape of it. It is funny how after you are done you think it is taller than it is, there is some shrinkage but it still always seems taller after I throw it. I threw this one the same night as the above piece. The cylinder from above I made into a small mug. This is a picture after it had been trimmed and I put a handle on it. My handles tend to still be a bit wonky. I need to practice this more. And the little bowl from above after it was trimmed. This mug I threw on a Saturday for more practice. I think this one has ended up being one of my favorites. I still didn't get it has tall as I wanted but it is the perfect coffee mug size. I need to make more time to go in on Saturdays and practice. I am thinking about making a series of these smaller beer stein looking mugs. Here it is all trimmed and with a handle. This one I threw in class and it ended up wider but not taller. Here it is trimmed up with a handle added. This is the white mug from above. I decided to paint some green underglaze on the earthenware and sgraffito some shamrocks in it. Here are some pieces I finished the glazing process on them. I plan on doing some blog posts of just the finished pieces on some of these. Another smaller beer stein. I was able to get this one a bit taller but I think it is a bit to narrow. I decided this year to give a yearly project another try. I wanted to practice painting with watercolor and decided to do a small mini painting everyday, well almost everyday. I did give myself permission to do makeup days. I got this idea from Andrea Gomoll, over the month of December she created an Advent calendar where she did a small painting in a circle everyday for Advent. I thought it was such a great idea that I decided to give it a try as a yearly project. I wanted to put a whole week on one page, so seven days per page. The journal I am using is a Mixed Media Strathmore Visual Journal that is 5.5 in x 8 in. I am also using a few different kinds of watercolor paint and might add to it throughout the year. I am using a Sakura Koi Pan Watercolor Travel Set, I have a few of the Winsor & Newton Cotman Watercolor tubes, and I have purchased both of Jane Davenport's travel watercolor sets. As for the black linework I am using a few different types of fineliner pens, and also some gel pens for details and additional color. Here are the weekly pages from January. This month a couple of my girlfriends decided we need to get out of the house more often. We planned to do this on Sunday's when we could all get together and go explore some of the local parks and nature preserves. If you would like to see more pictures from this hike you can check them out on my flicker page. 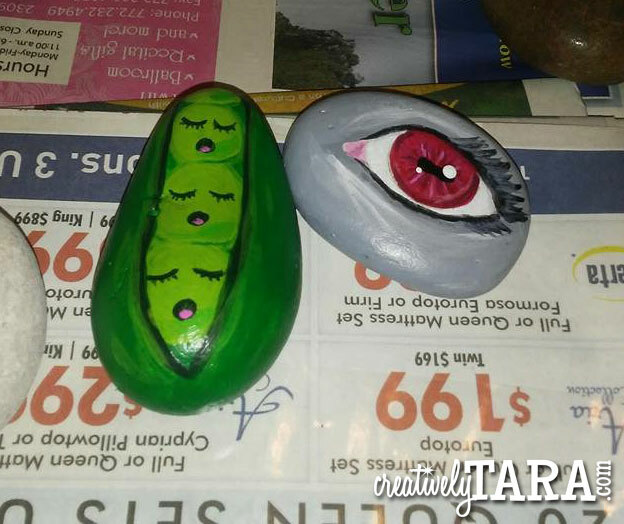 Our city has started a group where you paint rocks and hid them on your outdoor adventures. We spent a rainy Sunday painting some rocks. Here are the 2 rocks I painted. I still have yet to set them free into the world. Thank you for taking the time to join me on my monthly adventures. If you would like to see my work in progress pictures or just some creative randomness you can follow me on Instagram and Facebook. This was an ad I designed that went in the February 2015 Issue of the School Library Journal Magazine. I came up with the idea of the twins showing the two ways the books can be sold in a combined offer. I feel the design of this ad has a more editorial look to it then some of the other ads I have designed.